Hier sind ein paar amerikanische Designs zu sehen ! Here are some American Designs ! 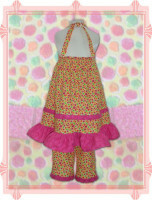 The halter dress and matching pants are made from bright and vibrant colors in 100% cotton. 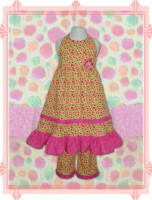 With a warm yellow background, you will find orange, pink and green dots spread about the fabric. 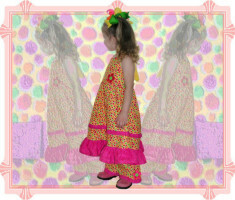 Both the dress and the pants have flower embellishments at the waist and ankles. The halter style dress has white ric rac details throughout the neckline and ties, and box pleating and ruffles in a coordinating pink fabric in the skirt. The pants are also edged in the same pleated trim.